Baldwin; Barbour; Coffee; Covington; Dale; Escambia; Geneva; Henry; Houston; and Mobile. 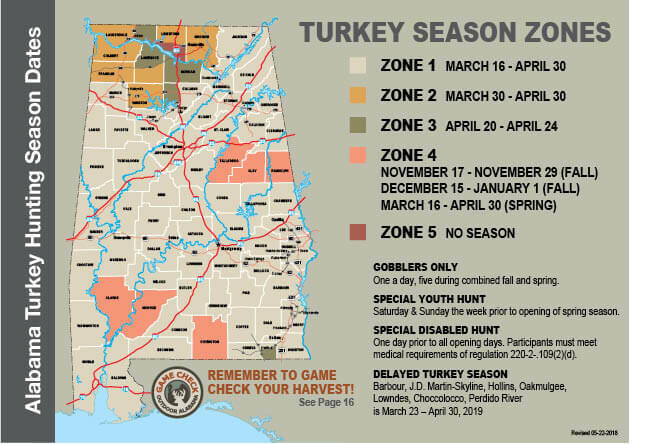 No running of dogs during daytime or after 3:00 a.m. during and in areas of spring turkey season. Check with USFS for further restrictions. All bobcat and otter, regardless of method of harvest, are required to be tagged by a representative of the Wildlife and Freshwater Fisheries Division within 14 days of harvest or may be left with a taxidermist with a completed tagging form, and the taxidermist is required to have the bobcat or otter tagged within 14 days of receipt. See Sunrise & Sunset Times for legal hunting hours. Dogs cannot be used to hunt during and in areas of spring turkey season. Bobcat – See tagging requirement (above). Bobcat and Fox – See Other Seasons & Bag Limits for information. Dogs only – no firearms allowed. Note: Permit may be obtained through your local district office for nighttime nuisance control hunting outside of the dates of deer and turkey season. Note: At time of printing, federal guidelines were not final. See Alabama Waterfowl Hunting Guide. Must register on-line at www.outdooralabama.com between June 5 (8:00 a.m.) and July 11 (8:00 a.m.). Must be Alabama Resident or lifetime license holder to register. Limit 20 frogs in aggregate per person from 12 Noon to 12 Noon the following day. Same shooting hours, bag limits, and legal arms and ammunition apply as in regular waterfowl season, in accordance with Rule 220-2-.119. 6 ducks a day — may include no more than 4 Mallards (no more than 2 of which may be female), 3 Wood Ducks, 1 Mottled Duck, 2 Black Duck, 2 Redhead, 2 Pintail, 2 Canvasback, and 3 Scaup. 5 a day, only 2 may be a Hooded Merganser. Note: At time of printing, federal guidelines were not final. See Alabama Waterfowl Hunting Guide. Statewide (including Southern James Bay Population Zone). The aggregate special early season bag limit of 5 dark geese (Canada, White-fronted, Brant) shall not include more than 1 Brant. Additionally, an aggregate bag limit of 5 light geese (Snow, Blue, Ross’s) may be harvested per day. Limit 5 a day, the aggregate bag limit of 5 shall not include more than 3 Canada Geese and 1 Brant, all five may be White-Fronted Geese. The aggregate bag limit shall be 5 a day. Note: Permit may be obtained through your local district office for the trapping of nuisance furbearers outside the dates of trapping season. WFF has collaborated with the AL Trappers and Predator Control Assoc., The Safari Club and the USDA Wildlife Services to host adult and youth trapping workshops throughout the state. Go to www.outdooralabama.com for dates and locations. For details on recommended planting dates for grains, see www.aces.edu/pubs/docs/A/ANR-1467/ANR-1467-low.pdf.